Broad-based sales growth, marked by a double-digit increase in emerging markets, lifted Boston Scientific’s (BSX) fourth-quarter earnings, which surpassed the Wall Street estimates. The medical devices maker also provided guidance for the first quarter and fiscal 2019. Following the announcement, the company’s stock gained in early trading Wednesday. All the business divisions and geographical regions registered year-over-year increase in sales during the December quarter. Total revenues grew 6.3% to $2.56 billion, which came in line with analysts’ estimates and exceeded the company’s own guidance. Revenues of the MedSurg segment grew 7.4%, while Rhythm and Neuro revenues moved up 5.1%. There was a 6.3% growth in the cardiovascular segment. At $0.39 per share, adjusted earnings were 15% higher compared to the fourth quarter of 2017. Analysts had forecast a slower earnings growth. Unadjusted profit was $386 million or $0.27 per share, compared to a net loss of $615 million or $0.45 per share a year earlier. Encouraged by the positive results, the company now expects full-year 2019 sales to grow 7-9%. Organic sales growth is estimated to be between 7% and 8.5%. Adjusted an unadjusted earnings are forecast to be 1.53-$1.58 per share and $1.13-$1.18 per share respectively. 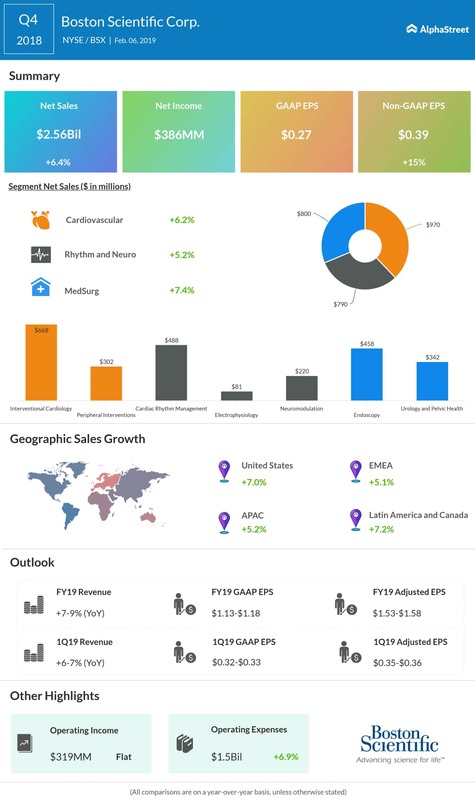 In the first quarter of 2019, revenues are expected to grow in the 6-7% range. 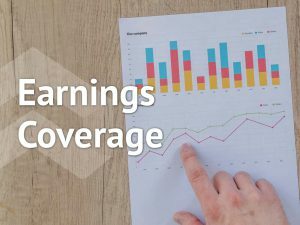 The management is looking for adjusted earnings in the range of $0.35 per share to $0.36 per share and unadjusted earnings between $0.32 per share and $0.33 per share. Last month, Boston Scientific closed the acquisition of Santa Rosa, California-based private firm Millipede, Inc. Earlier, an agreement was signed on the terms of the company’s proposed acquisition of UK-based BTG plc, a provider of products used in minimally-invasive procedures. Boston Scientific shares gained moderately in the early trading hours of Wednesday, after closing the previous session slightly higher. The stock has gained 46% in the past twelve months.